Pan fried poultry should be juicy. Its coating or batter should be crispy, golden brown, not excessively oily and free from any breaks that allow fat to penetrate. Both the poultry and the coating should be well seasoned. The most common pan fried poultry is fried chicken. Young tender birds cut into small pieces produce the best results. Other cuts commonly pan-fried are boneless portions such as chicken breasts and turkey scallops. Pan fried poultry is usually floured, breaded or battered before cooking. Typically, the seasonings are added to teh flour, breading or batter before the poultry is coated. Seasonings can be a blend of any number of dried herbs and spices. But often only salt and pepper are required because the poultry will be served with a sauce or other accompaniments for additional flavors. The fat should always be hot before the poultry is added. The temperature at which it is cooked is determined by the length of time required to cook it thoroughly. 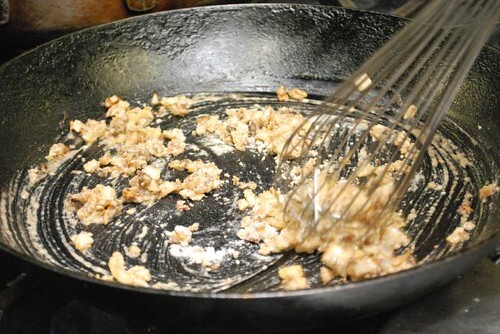 Pan-frying generally requires slightly lower temperatures to produce good color in a relatively short time. Thicker items and those containing bones require lower cooking temperatures and longer cooking times. 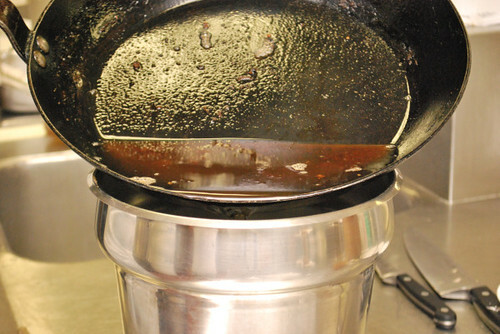 Even the largest pan-fried items may be too small to be accurately tested with an instant read thermometer, and using teh touch method can be difficult and dangerous because of the amount of fat used in pan-frying. So timing and experience are teh best tools to determine doneness. Thin scallops cook very quickly, so it is relatively easy to judge their doneness. On the other hand, friend chicken can take as long as 30-45 minutes to cook, requiring skill and experience to determine doneness. Because pan-frying does not produce fond or drippings that can be used to make a sauce, pan-fried poultry is usually served with lemon wedges, a vegetable garnish or a separately made sauce. 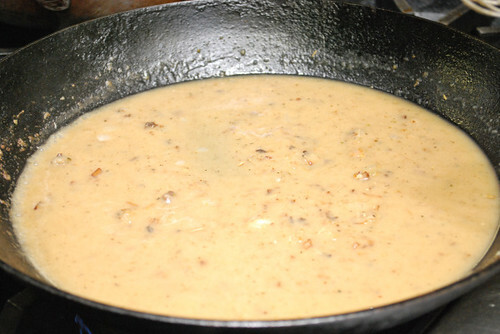 Fried chicken is an exception; it is sometimes served with a country gravy made by degreasing the pan, making a roux with a portion of the fat and adding milk or stock and seasonings. Heat enough fat in a heavy sauté pan to cover the item to be cooked on-fourth to halfway up its side. The fat should be approximately 325 degrees. 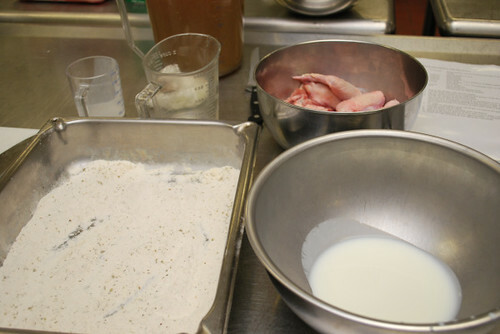 Add the floured, breaded or battered item to the hot fat, being careful no to splash. The fat must be hot enough to sizle and bubble when the item is added. Turn the item when the first side is the proper color; it should be half cooked at this point. Larger items may need to be turned more than once to brown them properly on all sides. 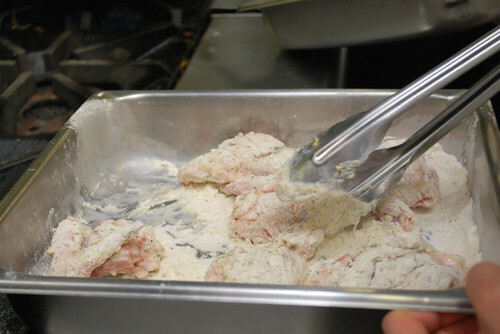 Remove the browned poultry from the pan and drain it on absorbent paper. Season the chicken with salt and pepper. Add the herbs and spices to 1 cup flour. 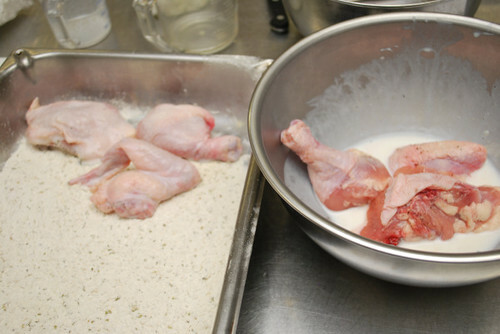 Dip the chicken pieces in the buttermilk and dredge the chicken in the seasoned flour. 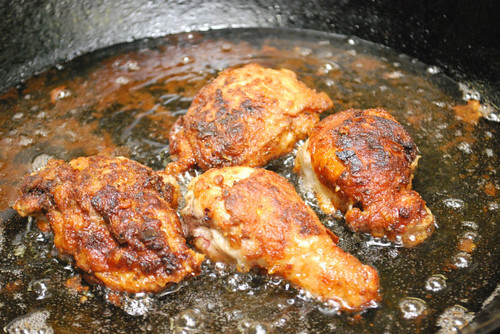 Pan-fry the chicken in oil until done, approximately 40 minutes, turning so that it cooks evenly. Reduce the heat as necessary to prevent the chicken from becoming too dark. Or remove the chicken when well browned, drain it and finish cooking it in the oven. 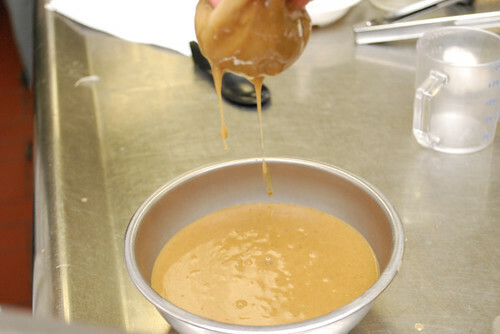 To make the pan gravy, pour off all but 3 tablespoons oil from the pan, carefully reserving the fond. Add the diced onion and sauté until translucent. 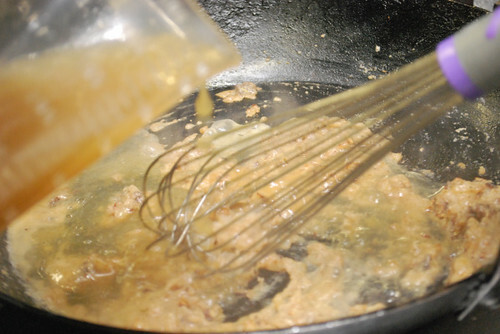 Add the remaining flour and cook to make a blond roux. Whisk in the liquid and simmer approximately 15 minutes. Strain through cheesecloth and adjust the seasonings. 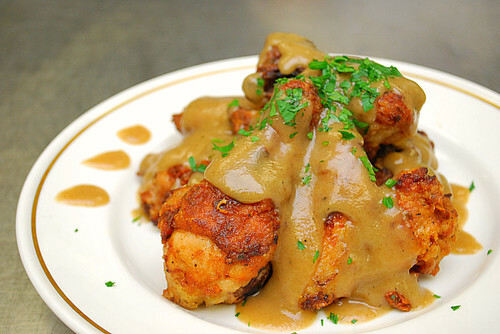 To plate, arrange the chicken on a serving plate and garnish with pan gravy and freshly chopped parsley, serving with additional gravy on the side. I am totally drooling! I just showed this dish to my husband and we're both wanting to make this, like, NOW!!!!! In fact, I'm going to make it this weekend, it looks SOOO GOOD!!! The color of the chicken is just beautiful! WOw, my hubs would looooove this! I made this for dinner tonight using pork chops instead of chicken. It was yummy! This really looks so delicious and so nice! I can't wait to try this one. Thanks a lot. Daphne - I thought the same things when my culinary instruction said the gravy needs to be strained! lol Thanks for your comment! Quick question though, when you whisk the liquid into the pan to simmer, do you just whisk in the broth, or the broth and the oil you poured out earlier? @Kat- you would whisk in only the 3 cups of chicken stock. 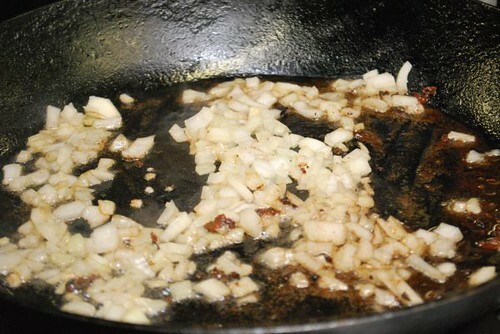 You would pour out or discard all the oil in the pan except for 3 tablespoons... and you will use that 3 tablespoons of oil to create the gravy. Hope this helps!